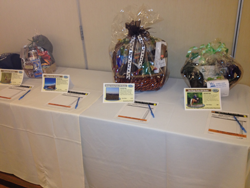 Each year the Conference attendees are able to bid on silent auction items – the proceeds from the silent auction benefit our emerging leaders scholarship program. Local Host Committee members, staff, organizations, agencies, and businesses donate creative, beautiful and valued items for the silent auction. All donations are tax-deductible, are applied toward conference costs, and provide a fun and effective means of promoting your products and services. Examples of gift items include: gift certificates, t-shirts and other clothing items, wine or other food items, jewelry and other artwork, books and trail equipment. View the 2019 Sponsorship Guide, which includes information on how to donate items. If you have silent auction or raffle related questions please contact Laurel Harkness by email or phone at 530.665.8090.